Dental implants have proven to be a sturdy permanent dental replacement for missing teeth. Dental implants provide the same functionality as a normal tooth. Precise planning for the placement of these dental implants is done using an advanced technology using CBCT. CBCT stands for Cone Beam Computed Tomography which is a sophisticated 3D imaging system used by Dr. Kidess for the planning stages of your implant treatment. Unlike regular x-rays, or most other types of imaging, CBCT scans can obtain clear, and precise 3 dimensional pictures of the bone structure, vital anatomical structures and soft tissue. CBCT allows the capturing of high resolution 3-D images for diagnostics and planning for the replacement of a missing tooth or teeth. CBCT performs this imaging function with the least amount of distortion when compared to other imaging methods. CBCT and 3-D treatment planning are considered the optimal technologies to provide the clinician with the necessary information for both single and complex cases for the placement of implants into the jaw (mandible or maxilla). 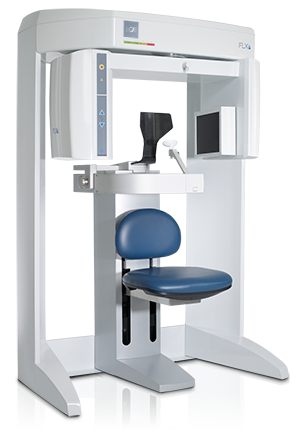 CBCT scanners are smaller-sized machines when compared to the traditional CT scanners that are used at most hospitals & major diagnostic scanning centers. The benefits of using CBCT include that it is quick to perform, safe and ensures the best fit for your dental implants. Short scanning period. It only takes about 10 to 70 seconds to complete scans. Low radiation. Reported dosages were 15 times lower than conventional CT scans. Bone density: Gives the ability to assess bone density surrounding the dental implant. Treatment Planning: Data can be manipulated easily to create the best implant placement. Simulation: Simulate the implant surgery on the computer prior to the actual procedure. Surgical Guide: Allows the doctor to manufacture a surgical guide with accuracy of 0.3mm. In addition to its use in dental implants, CBCT is also used in cancer screening, showing wisdom teeth position prior to extraction, root canal treatment in complex cases and prior to some orthodontic treatments. If you are seeking dental implants in Scottsdale – Phoenix area, Dr Kidess’s office is happy to provide accurate treatment planning with CBCT imaging for optimal replacement of missing teeth.